I know you have seen the tragic, heart-wrenching footage on tv after the earthquake in Haiti. And lots of you have already made a donation. But if you haven't yet and have been wondering where to send your money, I encourage you to donate to Hands and Feet Project. Hands and Feet is a childrens' village in Jacmel, Haiti that cares for abandoned and orphaned children and was started by the band Audio Adrenaline in 2004. (I know one of the founders of the organization and these are truly amazing people doing everything they can to help babies and children.) 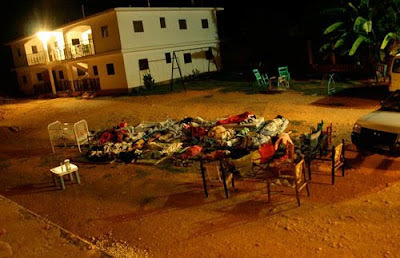 The children and organizers at the orphanage have been sleeping outside since their building is damaged, as you can see from the photo above. But these kids are alive and being cared for. From their Facebook updates ... "the mayor of Jacmel visited the orphanage today and told them of several children who are in the town just sitting on the streets, crying. Their parents were killed, and the mayor is hoping that they can take them in at Hands and Feet. We need to prepare for these new children to join the Hands and Feet family." They are taking in newly orphaned children this week, and any donation you can make will help these kids. 100% of the funds will go directly to the relief efforts there. You can make a one-time donation here. I know, it's just awful!! I'm making a donation. Just made my donation through Partners in Health, but I will definitely keep this in mind when I receive my next paycheck. Thank you Jen for this beautiful option. I have been sick like so many others about the these children with such great pain, injury and loss. I donated to Red Cross. But, wanted to find a charity like this. Seeing all the footage in haiti just breaks my heart. Thanks for the link. I've been wanting to donate somewhere but you never know where your contribution will end up.